The absolute star of the show for me during May has to be the Cowslip. One of the first wild flowers to emerge on the common this year, it has created a lovely burst of yellow flowers, which have stood up spritely to attention all month. 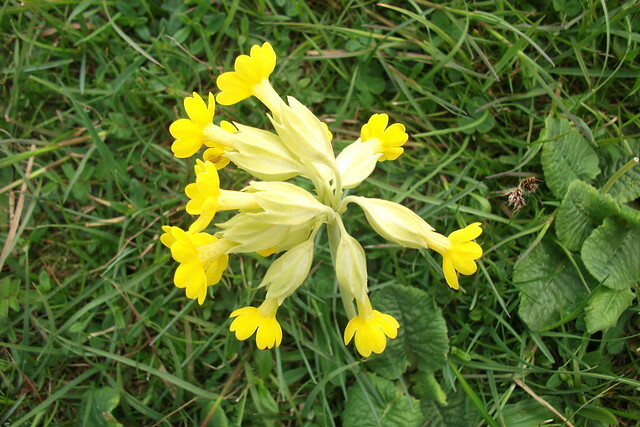 Found in the meadows where cows graze, the name Cowslip, is said to derive from the old English word for cow dung!..... my Mum, who was brought up playing and roaming around on the common around Coventry in the Midlands used to tell me this was her favourite wild flower. And I can see why, it's a cheerful little thing! When I was a little girl my bedroom curtains were green meadow grass with wild flowers on them. And as I walk across the common and can see why she choose those curtains. 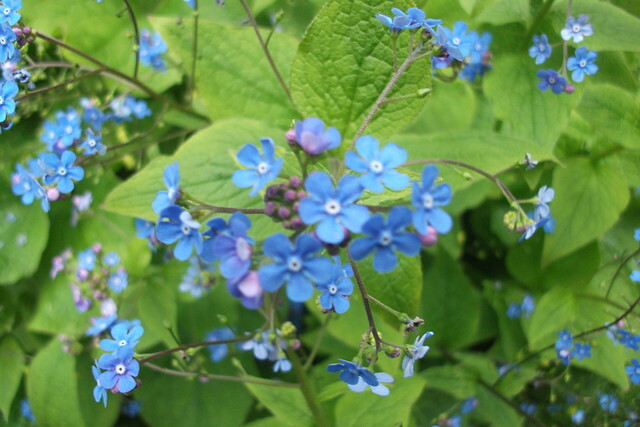 and then following that the beautiful blue 'forget-me-nots', scattered around the edges by the stone walls, and how could we indeed forget......, each year we remember how lovely they are! such a pretty blue and sometimes pink. My walks have taken me through moist damp woods, where the wild garlic likes to grow. 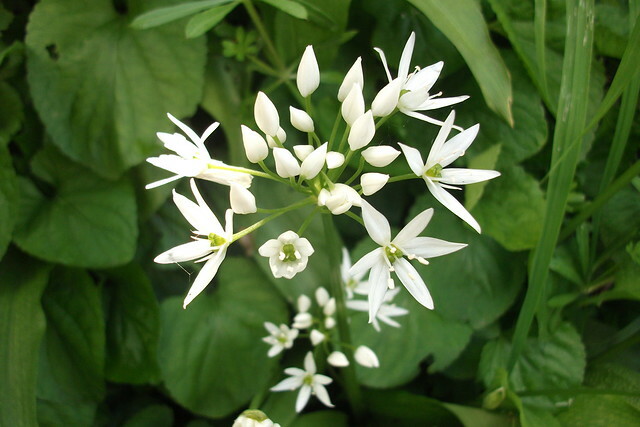 The air has been filled with the deep scent of wild garlic, and a magical carpet of pretty white star flowers have greeted me. So pungent. The leaves can be used in salads and are quite strong tasting, strong enough to make a pesto with . As I walk through the woods I just let the trees and the earth ground me. Breathing out the stress. Centering myself again. The woods seem to be able to carry it all. I could live in the woods. Deeply peaceful and away from the jangle of technology. But believe it or not I am actually an urban girl who likes to see people and places and the city too. My daily walks with my dog are my time to touch base. Always carrying my camera now and looking more closely than before. It's so enriching. 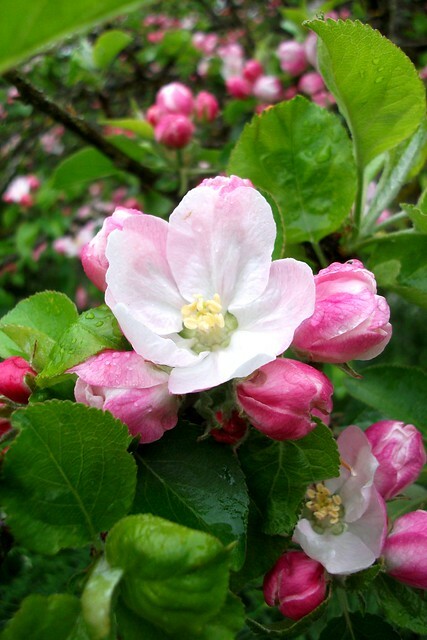 Closer to home I have wandered around the garden enjoying the apple blossom and looking forward to sweet apples this year. Last year there was only one apple! and it was lovely. Such a tease. There is lots of blossom so whatever happened last year, was it because of the weather or the disappearing bees? and plums too. Could it be a plum year I wonder? The plum tree likes to rest now and again. 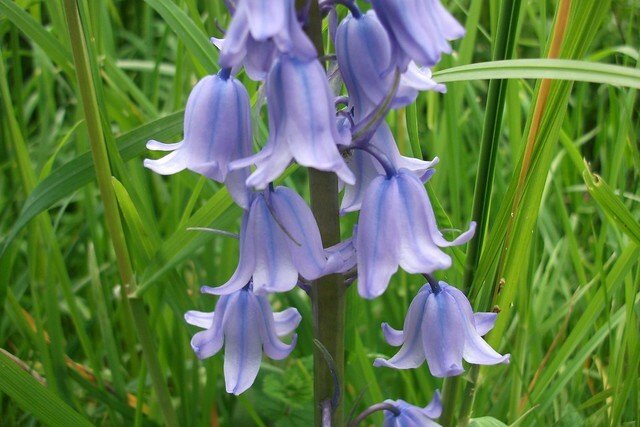 In my quest for the perfect 'bluebell'! I found this one in my garden. Such a pretty mauve colour. Just like little magical fairy hats, I think, possibly with little tinkling bells in! Can I squeeze in this one of where I live. Everything is so full and green right now. 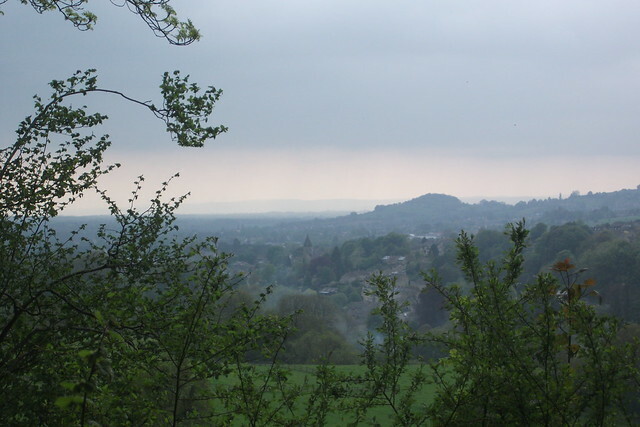 This is my view of the valley where I live, taken in the evening, from the woods. We seem to be having our April showers now at the end of May! At home my may quilt has found it's place for now on the back of my bench, and every few days I will find flowers for my table in the garden. There's lots of blues and purples in may! June will no doubt herald it's own stunning parade of colours. Me and my camera are ready! The Cowparsley growing under the apple trees has reached shoulder height, at least for a 5ft 3 person! and will need to be strimmed. There's a huge amount of mowing going on here at the moment, the grass just keeps on growing! I think of it as my green gym work-out! But this half-term week has been a creative one, thanks to the rain. More sewing to show soon. The sun is trying to squeeze it's way through today. This week has been a difficult one my friends. The challenges of the teenage years are hard for this single Mum. I learn more each day really. Try different things. You have to try and then sometimes you have to leave alone. Hoping we will bump through to happier less challenging days soon. So come on June, we are ready for you. I know you will bring your challenges and decisions to be made. I know I need to act on some things. I can't sweep everything under the carpet. But please bring some happy sunny feel good medicine too! oh and slugs please don't eat my lettuce, at least not all of it! do you garden in the rain!? sorry to hear that youve had a difficult week, its hard to find just the right middle ground with teenagers somtimes, I went through it 3 times and sometimes wonder how I got throught some of those difficult years, but somehow we do! I just love your flowers - its winter here and the shops are selling hyacinths and tulips at exorbitant prices! I may have to treat myself to some! Hello again Heather! 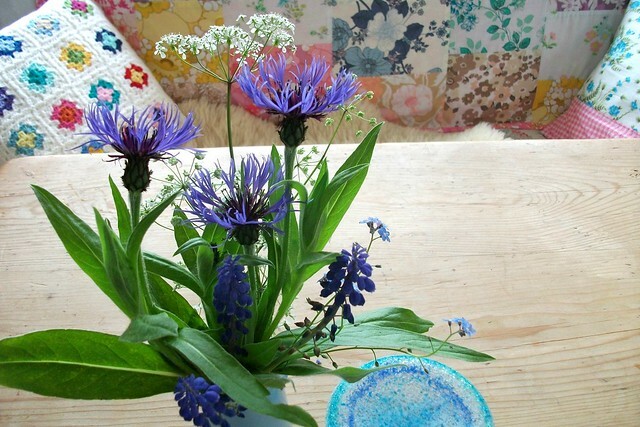 What a lovely post with such gorgeous pics, the blossoms, the wild garlic, forget-me-nots, WOW! So uplifting - I've really enjoyed my visit with you and thank you for it! Life can be a trial at times with teenagers but you know love always wins the day, the sun will keep shining (if intermittently), and you can find yourself in your wanders among nature's beauty. I wish you both the very best! I can see/perceive such similarities in the way we are, Heather. I also love my solitary daily walks- I think, meditate, pray, and all kind of good things come to me during that alone time! I alsways have my camera or Iphone with me, to really notice and capture the beauty. such beautiful wild flowers!!!!!!! wow! .....may I send you a lot of hugs and smiles? Maybe they can do the trick!!!! 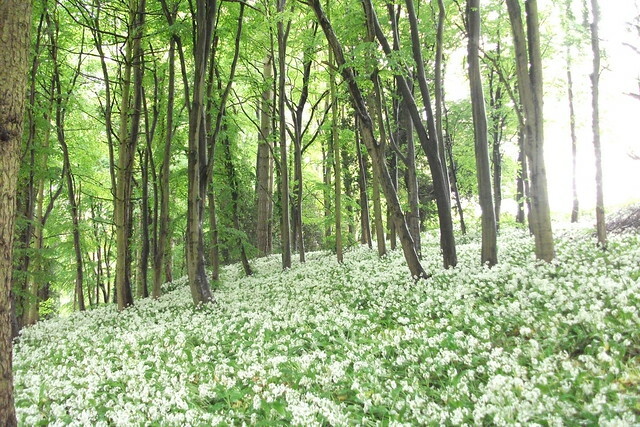 I love the carpet of wild garlic:)) So lovely! There are some flowers like these growing near by, but not like in your photo. Hi Heather,Parenting must be the hardest thing we get to do!! !I personally think that following your gut on right and wrong is the only way to go! !If it feels wrong then it is wrong!! !Love that you use nature to ground you!! !I think your view of your valley is stunning!! !What a joy it must be to see that every day and to watch it change with the seasons! !Hope you have a happy and sunny bright and joyous week!!! Wow! I can't believe that wild garlic. So beautiful. I have often thought that there are loads of how to raise your baby/toddler books, but very few on the subject of teens--or very few are embraced enthusiastically like baby books. So many times I have found myself in tricky and unimaginable circumstances with my teen boys. Hi Heather, what a stunning part of the world you live in. I would love to take a walk with you across the common and see first hand all those lovely flowers. But, like you, a part of me yearns for people and architecture too!! Lovely photos, cowslips always remind me of my childhood.